Phase Three ... 80 per cent complete. Construction work on the fourth phase of the Bloom Gardens project in Abu Dhabi, UAE, is expected to start this month (September). The project is in the final stages of building permit approval, according to Bloom Properties, the developer. 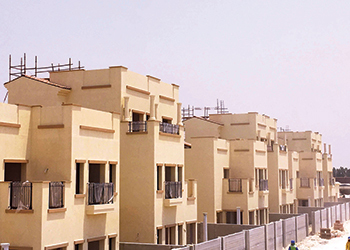 Located near Khalifa Park, Bloom Gardens is a residential community. The latest phase, named Faya, comprises 132 townhouses made up 28 four-unit clusters and four five-unit clusters. The project is scheduled for handover in December 2017. “Faya will be developed to the highest standards in design, architecture and construction, while providing attractive long-term investment returns for UAE national investors,” says Sameh Muhtadi, CEO of Bloom Holding. “In addition to its prestigious location, the project will feature modern and contemporary architecture with an efficient and intelligent design that maximises the value of the living space. It will offer the same upscale amenities as Bloom Gardens, Phases One, Two and Three, including round-the-clock security, ample parking space, as well as walking and running tracks and children’s play areas. Earlier this year, Bloom Properties announced the start of construction work on the third phase. Featuring 147 units, Bloom Gardens’ Phase Three comprises three-bedroom townhouses, semi-detached three-bedroom villas and four- and five-bedroom villas. Construction work is 80 per cent complete, according to a spokesperson for Bloom Properties. The structure of all villas is complete, interior fit-out works is 60 per cent complete while the exterior works, including roads and landscaping, is 50 per cent complete. Phase Three is targeted for completion in November this year and handover will start a month later. Boasting a total of 372 outstanding residential units, Bloom Gardens is located on the Eastern Corniche in Abu Dhabi. The exclusive residential development, which opened for sale in 2010, is set amidst a distinctive Mediterranean ambience with lush environs. The architecture integrates Italian and Andalusian styles, built and finished to excellent standards. Premium amenities and sports facilities are close at hand, along with landscaped recreational areas and a clubhouse. The project is also home to Brighton College Abu Dhabi, which was established in 2011 by Bloom Education in association with Brighton College, UK. The school is located in the proximity of ministries and several government departments and offers easy access to the Abu Dhabi-Dubai highway. Bloom Gardens will include a polyclinic, nursery and community centre. Set to open this year, the community centre will include sauna and steam rooms, a multi-functional hall for hosting various events and a community mosque with the capacity to hold 200 worshippers. The centre will also host health clubs, a gym and swimming pools for kids and adults. The polyclinic is expected to be ready this month.